Sometimes I try to ignore the existence of vintage fragrances on auction websites, and the raves they may receive on the perfume blogs, because what's the point of falling for something that's already discontinued or reformulated beyond recognition? And I'm usually pretty successful in this effort. Recently, however, I was intrigued by author M.J. Rose's description of an unnamed men's fragrance in her novel The Book of Lost Fragrances, and when I learned that Fabergé's Aphrodisia (the men's version) had been her inspiration for that scent, I wanted to know more. Thanks to a kind Now Smell This reader, I now own a bit of Aphrodisia (the women's version), and I'm hooked. According to my trusty copy of The H&R Book: Fragrances Guide, Feminine Notes, Fabergé Aphrodisia is a "fresh-mossy-aldehydic" chypre that includes top notes of bergamot, lemon, neroli and fruit; middle notes of rose, honey, ylang-ylang, carnation and jasmine; and base notes of oakmoss, vetiver, civet, ambrein and musk. Aphrodisia was released in 1938 and was available in various concentrations throughout its lifetime. I've been wearing a cologne version that seems to date from the 1960s. I'm not sure when this fragrance was discontinued, but it was still in circulation when the H&R guide was published in 1984. When I do try a vintage fragrance on my skin, I give it a few extra minutes to "set" before I sniff my wrist, so I did this with Aphrodisia. The first impression it gave me was a richer, fruitier take on a classic cologne, with the lemon note smelling candied or preserved rather than freshly peeled. A half hour later, I was enveloped in a spicy, honeyed floral. Aphrodisia's heart contains a lovely carnation note, the sort that is becoming woefully rare these days (due to reported restrictions on certain ingredients). I'm a longtime carnation lover, so this phase of the fragrance made me particularly happy. A soft yet rounded rose note also made a brief appearance, only adding to my delight. Aphrodisia's base is the kind that will make vintage fragrance lovers smile a "they-just-don't-make-them-like-this-anymore" smile, although it will probably seem stereotypically musty and "old" to anyone who prefers her perfumes pink and clean. It's not the most distinctive part of the fragrance, but it's wonderfully typical of its era: a mix of musk, oakmoss, and ambergris (a legendary aphrodisiac!) that doesn't exist as such anymore. It's not heavy, however, and just enough of the honey-floral-lemon notes linger to add some brightness and sweetness. 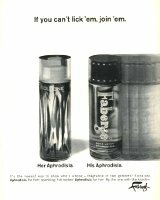 Aphrodisia is long lasting, even in cologne form. I don't know how it was originally priced, but it was probably quite a good value. Lastly, adding to this experience of mixed emotions, something about Aphrodisia reminded me of my grandmother and her perfumes. I don't think she wore this specific fragrance, but she did love carnation perfumes, and the overall "feel" of this one fits her era. I'll think of her whenever I wear the rest of my decant (thanks again, S!). I might even be inspired to try a few more vintage scents from Fabergé and similar lines, even if I risk losing my heart to other vanishing fragrances. To read about another vintage Fabergé fragrance, see Angela's review of Tigress here. Woodhue and some of the others are great too . I’ve heard that Woodhue is pretty much the same whether you get the men’s or the women’s . Oh, this sounds lovely! I would welcome more scents with a honeyed feel. And spicy, honeyed floral sounds divine. I will try to resist the urge to seek it out, though! I hate to fall in love with the hard-to-find and fleeting! Yes, that’s exactly the problem, MR! Woodhue seems to have quite a few fans… I think it might be next on my list! Thanks for the review Jessica! I loved the mood tag lines they had – Aphrodisia’s was “My mood is Sophisticated”. Woodhue was my fave too, but I always wondered why they chose “My mood is Inquisitive” for it. It seemed so tame, almost boring, compared to the rest. Tigress was “My mood is Purr-rry”, Flambeau was “My mood is Torchy”, and the later Kiku was “My mood is Sunny”. F Sharp was another one, but I never smelled it and don’t know what it’s mood was. I think there’s one last one, but I’m drawing a blank on the name and mood right now – It’ll probably come to me when I’m doing something totally unrelated and boring, lol. You certainly know your Faberge! I only remember the first three, Aphrodisia, Tigress and Woodhue, because my mother had a triplet set of them on her dresser when I was little. I can only recall the bottles, not the scents themselves. That’s how I met them too, someone had given my Mom the same set of three! She’s never been much of a perfume person, and would pass any scented gifts on to me. I was around 11/12 at the time, and would have loved to be ‘sophisticated’ or ‘purr-rry’. I was pretty bummed out that I ended up just being ‘inquisitive’, lol! Ha! But inquisitiveness is a better quality to have in the long run, as your mother might have said. Great marketing on the part of Faberge. So true, especially at that age! You had me at the word ‘honeyed’. But I will resist seeking this one out. I’ve had a few too many poor experiences of vintage stuff recently. I know that ‘vintage’ base quite well. Real oakmoss – when no-one gave it a second thought! How frustrating is that! And, as you say, Aphrodisia was probably quite inexpensive. GRRR. The only vintage purchase I have allowed myself recently is a small decant of pre-reformulation Dioressence from one of the decant services. Quality is excellent and of course, the fragrance is beautiful. I have learned to turn my frustration that ‘they-don’t-make-’em-like-that-anymore’ towards searching out and celebrating the best I can afford of some of the niche sellers who are selling beautiful fragrances in the grand classical style, but with their faces turned resolutely towards the times we live in. So: Tauer, Sonoma Scent Studio, Patricia de Nicolai, Parfums d’Empire. I’m sure other people will have their own list. I agree with that sentiment about the niche perfumes making old-style scents… SSS Nostalgie is a perfect example! and, although they’re so expensive, some of the Amouage fragrances are so classical. I have that same edition of the H&R Guide. It really drives home how much the perfume market has changed in the last 30 years or so. I would estimate that about 2/3 of the perfumes listed in it are discontinued now, and most of the rest are probably reformulated to death. I find the H&R Guide indispensable as a reference for those lost perfumes. Your resolve to ignore them is no doubt admirable, but for my part, my memories of some of them, or of the advertising for them, are so strong that I occasionally cave in to the desire to smell them again. What I do try to ignore is ultra-expensive or not-available-in-the-U.S. scents. After all, what is the use in falling for something for which I can never hope to obtain a full bottle? At least some of these discontinued “drugstore” perfumes are relatively easy to obtain. Well, I *am* hoarding a few things that I purchased before they were altered… using them very sparingly!… and, for educational purposes, sniffing old/discontinued things that cross my path in one way or another… but it’s such a slippery slope! And I do love my H & R guide, even though it makes me a bit frustrated about things I never had a chance to try or things that I used to love that don’t smell the same anymore (e.g., Lauren). I’m so glad I found this book in a used bookstore when I did! If you want some vintage Lauren let me know, I’ve got a good size bottle and I’ll never use the entire thing. Fearsmice, anything that was called Xanadu and was sold in a purple bottle *must* have been fabulous! Oh, I have that H&R Guide! Back in the 1990s I saw it in a New York Times ad and ordered it by mail. So tantalizing! I spent hours admiring the beautiful bottles and trying to imagine what they smelled like based on the notes. Before the internet and ebay, most of those perfumes were more unattainable then than they are now. Of course I still haven’t smelled most of them. but I succumb to temptation from time to time. Wore this throu HS, and scored the cologne (so tenacious for EdC) on ebay. Hell, yes, there’s ambergris in this. I get dark fruited chypre plus a salty/oily/marine aspect. They don’t make’m like they used to.